Old Set - Textures on the chair are linked to the table. Table is low poly (I think around 300) which is why I chose it as the repository object. 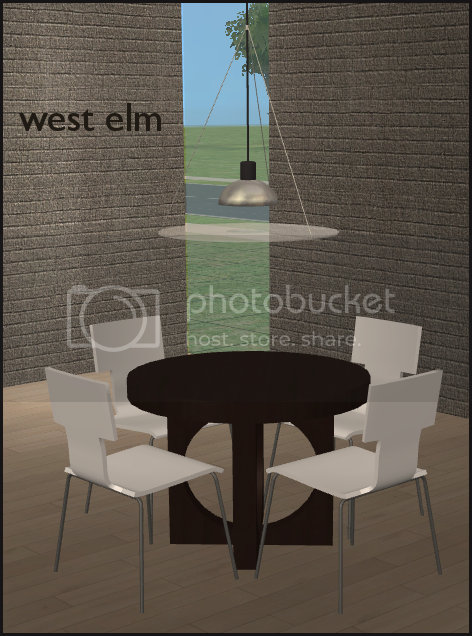 There are a total of 20 wood recolors, 3 solids, and 3 leg recolors for the dining chair. Recolors have been split between this post and the post below. Thank you, this is wonderful. I've been looking for a nice round table for a long time now. The dining sets are beautiful. I have been trying to play without cheats and those houses are so tiny it's nice to have a round table. Thank you! love the lamp, thank you. Great design. Thank you for sharing. This has been one of my favorites from West Elm for years now! So glad you made it for my sims! Now, how can I talk you into getting it for me??? :icon_scratch: LOL Thank you sweetie! HOW CAN YOU GO WRONG WITH ANYTHING INSPIRED BY DONGHIA [CHAIR]? EXCELLENT RENDITION. THANK YOU! Sherry, Thank You for this gorgeous dining! It is Perfect for an Apartment! All of Your Sets are incrediable!